Wooo! What a chapter! There’s a lot of stuff to go around here, from the time-leaping mystery woman Toki to the three calamities and the demonic island of Onigashima, so let’s get started! -last panel you said the war of want will take place in two days, isn’t it two weeks? Its not Name on the frontpage, Her tattoo is missing and the smile is… not Nami. 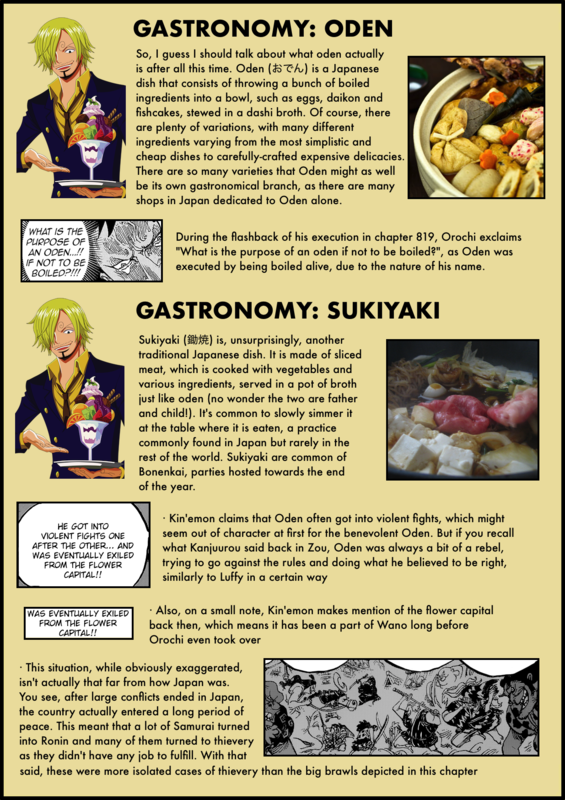 Oda does not ship his characters, so it would never be nami > robin i think. Oh well, the tattoo is missing, thats enough. Is the retainer with the amigasa hat the gentleman who visited crocus? And wow King looks like the son of hogback and Mama. On the cover page of chapter 631 we see Crocus having a drink with someone who looks a lot like the fifth retainer. 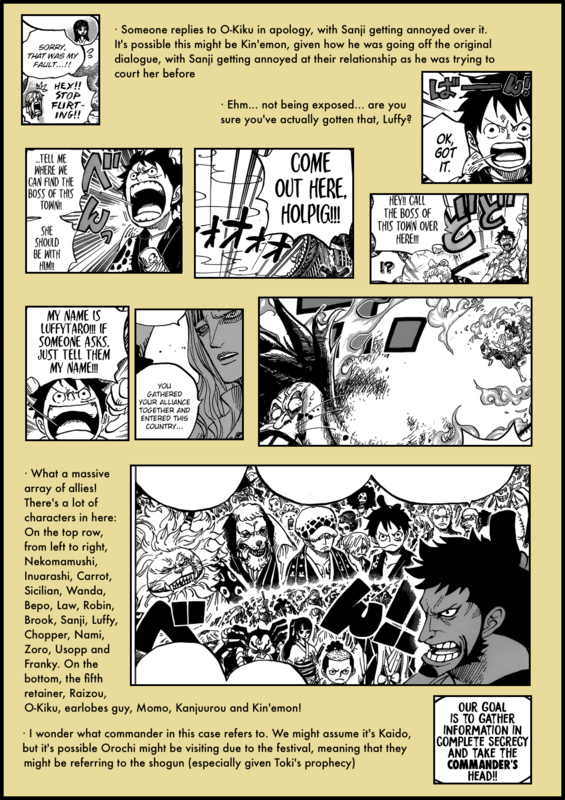 Could the fifth guy who we cannot identify be the same guy in the cover of one piece chapter 631, where he talks to crocus??? I have a theory for you. Momo’s sister name is Hiyori, means “Weather”. Now remember, Nami was found, we don’t know her past. And after the Time Skip, Nami has exactly 20 years. What if Nami is Momonosuke’s Younger Sister? In my opinion it does not match. If Nami is just 20 years old, that means she was just born when we see her in the burning castle…However Hiyori in that picture is at least 4-5 years old. Can’t be, Nojiko and Bellemere found Nami as a baby of at most a year old in some war, Hiyori was seen in that flashback as 2 years younger than Momo at most. Also, needless to say, Nami is 20, but Hiyori seemed to be slightly old herself, around Momo’s age. 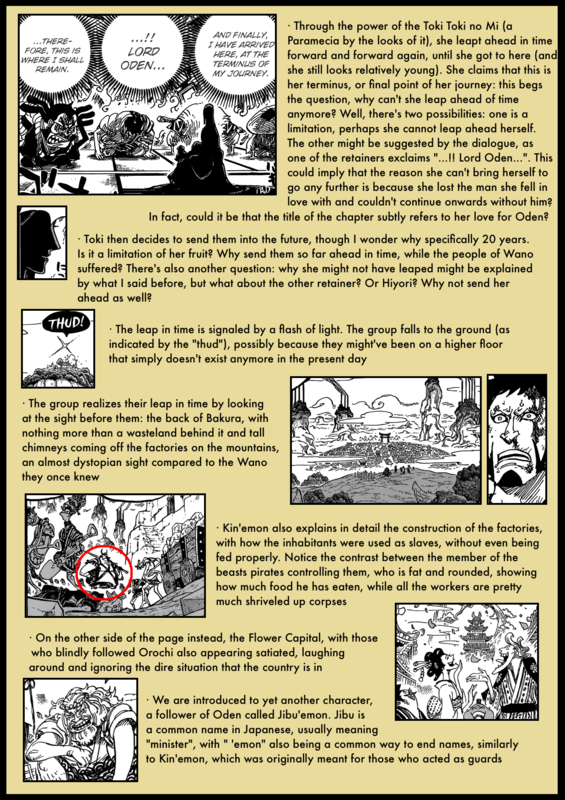 just to mention what people say that the fifth one of the retainer with the straw hat appear in the cover of chapter 631 with crocs check it out. and just asking arthur : does law and the other in wano know that luffy becom one of the yonko cuz wano is kind out of the world, the news don’t go in there ??? Nice!!! Congrats, every review is awesome. Who do you think is yet to come in Wano? Maybe Weevil? and Admiral fleet? Hi there librarian! I thought that you were going to explain this in your analysis, but since I haven’t seen any reference about this here I go: The first thing that came to my mind when reading about Kuri was Mugen from Samurai Champloo. He came from the Ryukyu Islands, which at the time (and in real life) where used as penal colonies. So that made me think that Kuri was based on those islands. What’s your opinion? You outdid yourself with this one. I was stunned with all of the detail and questions packed into this chapter and felt a bit overwhelmed but your clear analysis made it easy. Thanks as always. 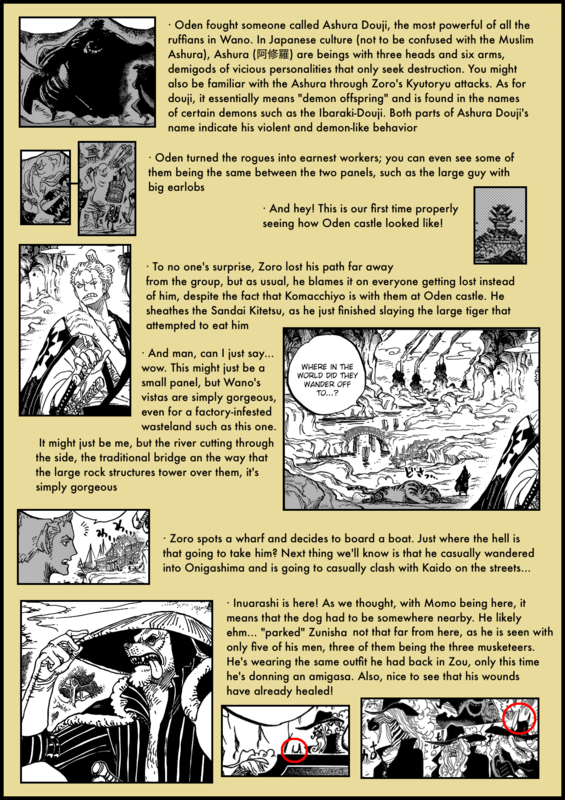 Introducing time travel, even if it’s only going forward, is raising all kinds of questions in my mind about the big stuff: the straw hat, Raftel, even the One Piece… This Wano arc is going to be something else! 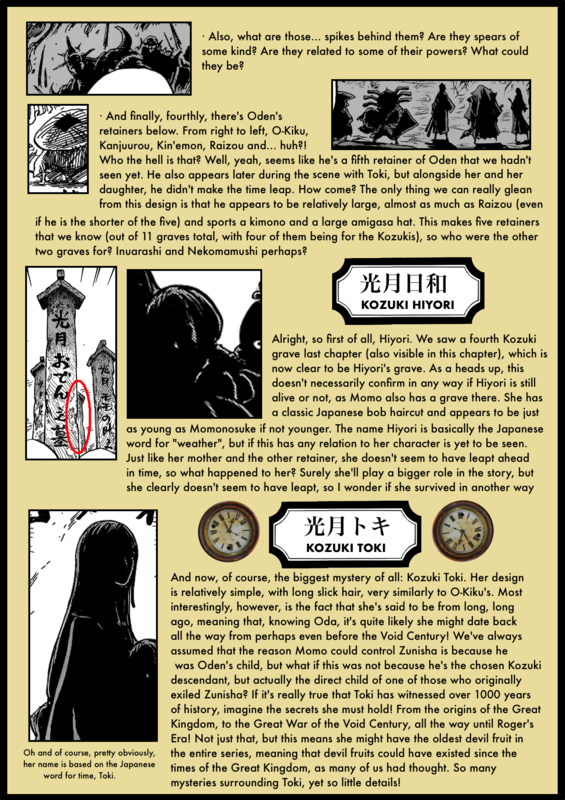 Hold on just a minute here… we just might know where Hiyori is already: Serving as navigator for the future pirate king! The mystery of Nami’s origin is something that’s been slow roasting in the back of my head for a long time now: We know that her ‘mother’ Bellemere found Nami, already an orphan, on an unknown battlefield ->roughly 20 years ago<-. 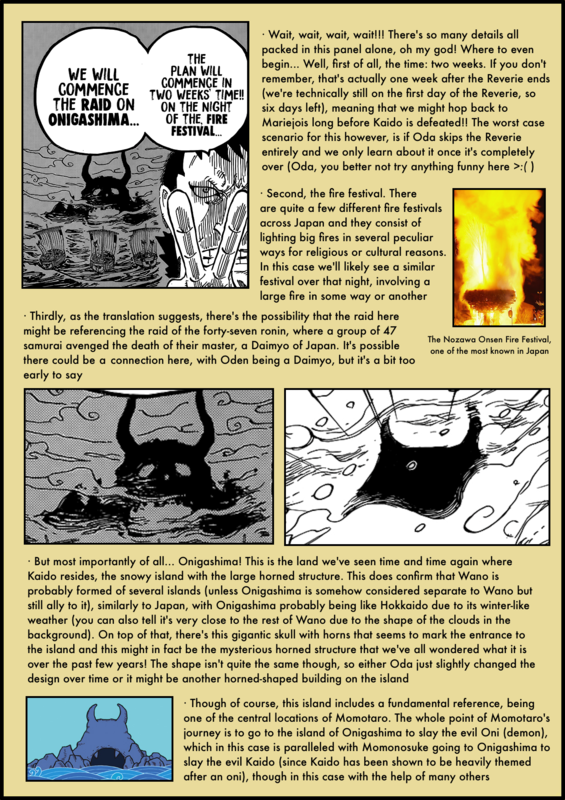 Oda has also repeatedly hung a lampshade on Nami's, seemingly innate, ability to read the weather, and now we're presented with a mysterious baby girl, born roughly 20 years ago who was named for the weather. I’m curious where you’re getting your info about Hiyori’s age. From this chapter all we are told is that she was younger than Momonosuke. I would also add that not even Nami herself actually knows when she was really born, or exactly how old she really is. Sorry for the multiple replies (can’t edit) but there is one more important consideration, though it is very meta. 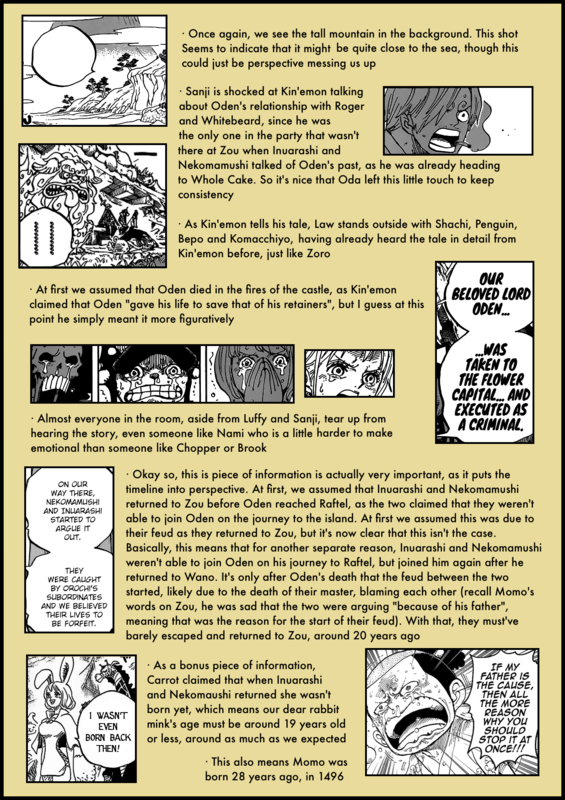 Nami’s past has been a hanging mystery for just about the entire series now, and it certainly isn’t like Oda to just leave such a mystery alone without some sort of plan (Sanji for example). Like Chekhov’s Gun, this isn’t something that will never be explained. But the series is rapidly approaching it’s conclusion. With so few opportunities remaining to explain who the hell Nami actually is, suddenly dropping a mysterious orphaned girl named Hiyori into the story at *roughly* the same time that Nami first appeared as a mysterious orphan girl with an affinity for the weather certainly raises my eyebrow. Nami was born in 1504. By that time, Hiyori was already, at the very least, a few years old. On the flipside, Bell-mère found Nami as a newborn. Besides, if that were the case she could’ve commanded Zunisha as well. Absolutely true. The other problem seems to be Nojiko. Nami was with Bellemere and Nojiko since she was a baby. Just check out chapter 95. So even if Hiyori timetraveled or just traveled it wouldn’t fit. Since Hiyori was at least older at the time we see her with Toki. Hey do you guys remember that guy that talk and drink with Crocus way back then? Is he related? He wear samurai clothing. Who is he? Really, very amazing analysis as usual. Thanks again for the good work. The fifth guy showing there could be Tenguyma Hitetsu. Thank you so much for detail and deep analysis. I like all of them. Actually this is my first time come to website (thanks for Tekking101 for recommended). I enjoy read your analysis. While scroll down suddenly some question pop up in my mind. And the question is how did Moria get Ryuuma corpse? When did he stole that corpse? I hope you can explain (if my question has already answered). Anyway thanks again to all your hardworks. I really appreciate it. Supposedly he took it 23 years ago, 3 years before Orochi took over, back when Oden was ruling. 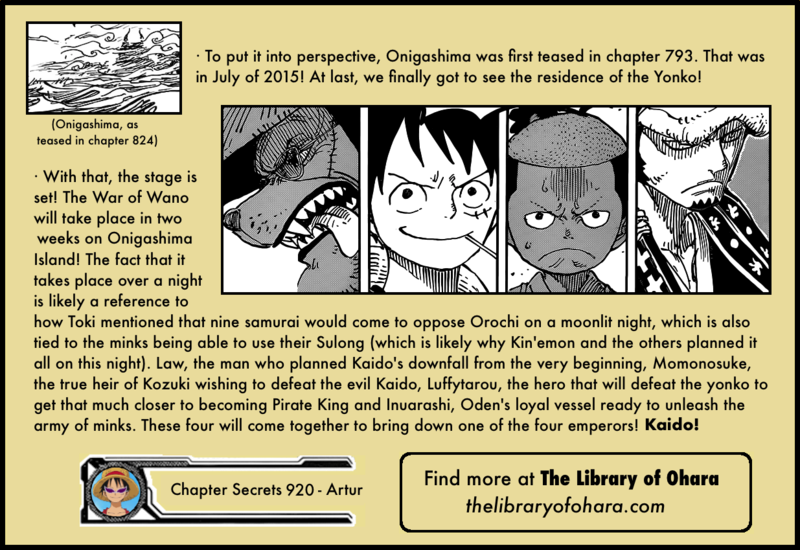 How he did it, if that was when he fought Kaido, or any other details, are unknown. Hey there Artur, been reading your work for awhile now. This time I couldn’t believe I caught a reference you hand’t mentioned so thought I’d share it! Jibu’emon and his team are based on a very famous ancient chinese novel: Journey to the West, which is still being widely read and depicted on screen in Asia today. Jibu’emon represents Sun Wukong, the monkey king. He has a hairy body and wears a crown just like Wukong. In the novel, Sanzang (the monk) uses the crown to keep Wukong disciplined during the journey (he chants to tighten the crown around Wukong’s head). On his right is Tang Sanzang the monk. Though Oda’s depiction is quite different from the image of Sanzang, the scepter he holds with the rings gives it away. To the right of Sanzang is Zhu Bajie the pig. Though not depicted as a pig here, his huge body, ears and oversized earlobes remind me of Bajie. To the left of Wukong is Sha Wujing. Wujing is ALWAYS depicted with a bearded face, as Oda did here. He also holds a pole weapon in the novel. Hi Arthur. It just occurred to me while reading you describe Momo’s mother’s powers that she might be -related?- to the person who sat on the throne in the reverie Arc. Didn’t have time to think it through though. Also, we love your work. I am from Niger in Africa, somewhere you probably will never imagine people know of you. If Sulong and the presence of the moon are integral to the plan, a somewhat interesting twist would be that the environmental pollution caused by the factories would obstruct the moon’s visibility. 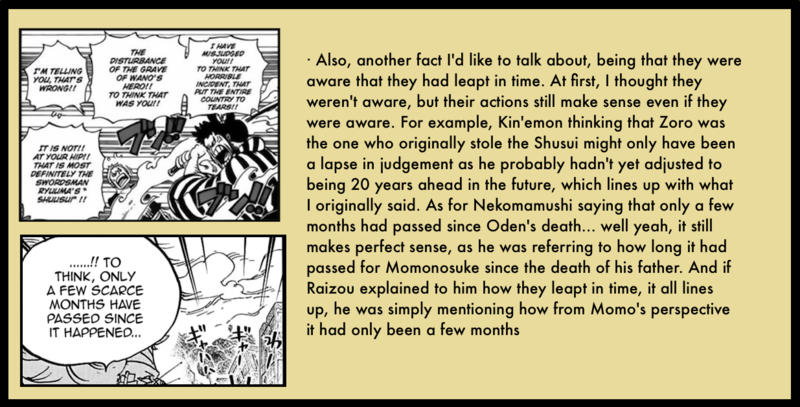 Though if there have been shots of the moon in Wano already, then this doesn’t really apply. Hi Artur, another great analysis of yours! Here to leave my thoughts about Hiyori: what if she is Kuina? The age is pretty much the same, while her and Zoro’s teacher is a Kouzuki Retainer. It could be that someone discovered something about her, so they had to forge her death, and now she will be back to help. Amazing analysis ! You really do great job here ! Keep going ! 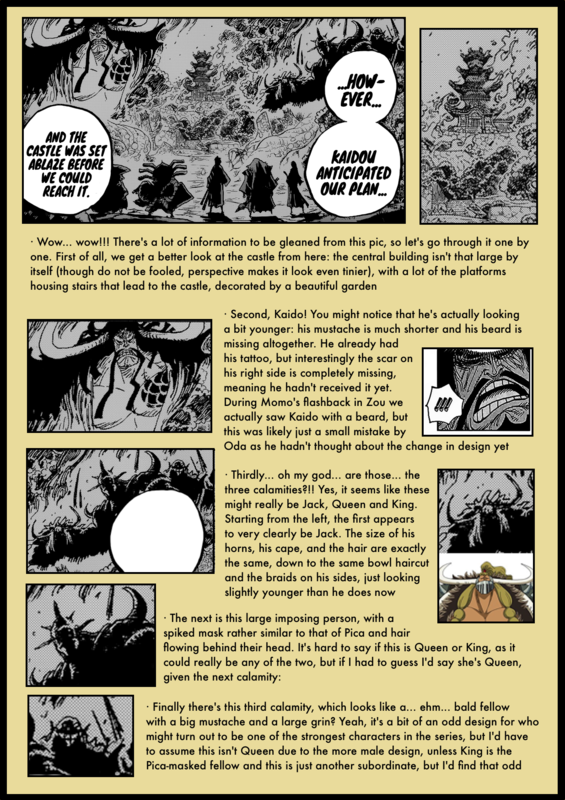 Just a question : With the samuraï marked with a “crescent moon” on their ankles, do you think Black Beard will come in Wano ? 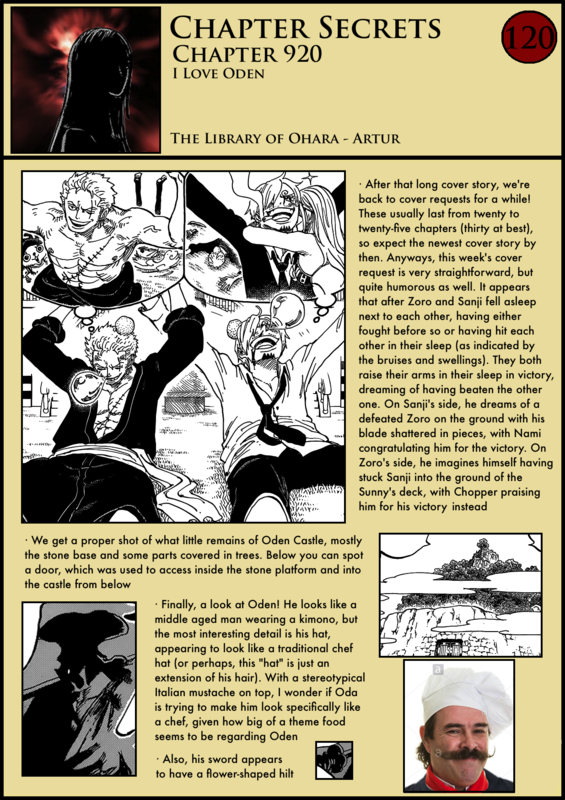 Because in Marineford (before Timeskip) Teach recruit Catarina Devon known as “The Crescent Moon Hunter”. Do you think there is a link with that tatoo ? Honestly, with the way the other Disasters’ silhouettes seem to be angled, I’m almost convinced that there is no female among them. I could be wrong, but that remains to be seen. Still, I think the Disaster you call King is kind of modeled after the Saturday morning cartoon version of Doctor Eggman with the head shape and toothy grin. Hopefully, we’ll meet these tough nuts in time. 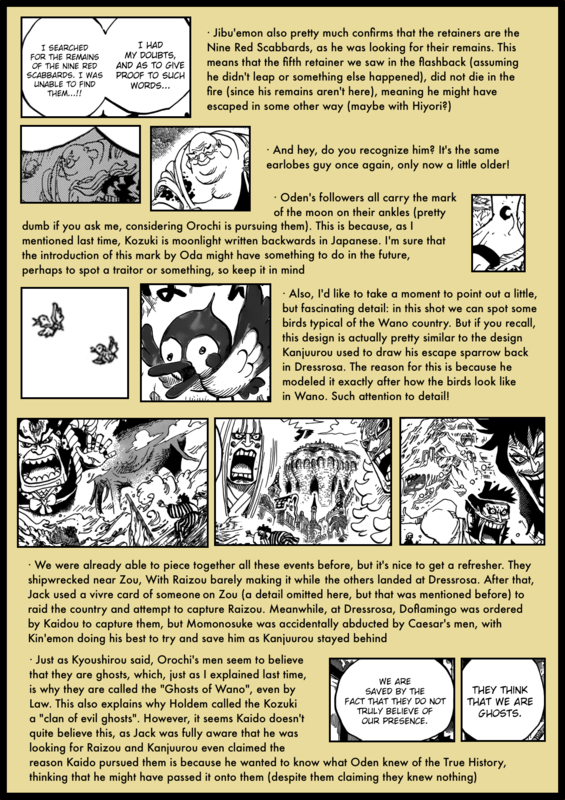 About the Onigashima island, the change in design might be interpreted that as in the perspective of kaido´s enemies, the “Gate-structure” looks more like a oni´s skull (being where the Kaido lives), tying with the whole oni theme Oda has for Kaido.